Missing in the tsunami of coverage of the First 100 Days—if it’s possible that anything has been left unwritten or unsaid—is that both President and Michelle Obama have largely shed what appeared to be their greatest vulnerabilities in the final months of the campaign. For the would-be president, it was his lack of experience. Exasperated Republicans tried their damnedest to sound the alarms. He’s never actually done anything, the argument went. 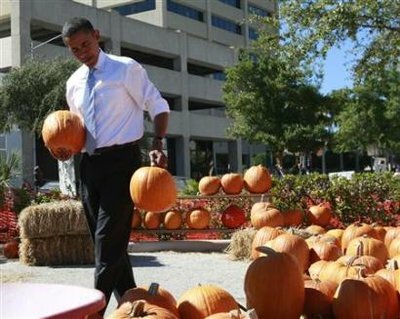 Do you really want him in the Oval Office when crisis strikes? Nervous Democrats fretted, mostly in private, and wondered if maybe John McCain wasn’t better suited to the job. For the potential First Lady, her alleged Achilles’ heel was her “anger.” Her “for the first time in my adult life I’m proud of my country” moment became a catch-all for the country’s unresolved feelings about working moms, opinionated political spouses, and African Americans romping on the lawn at 1600 Pennsylvania Avenue. How can this possibly work? people wondered. Fast-forward just three months past Inauguration Day, and those concerns have all but disappeared. To be sure, the critics make other arguments, especially about him. He’s doing too much. (Or he’s not doing enough.) He’s moving too fast. (Or he’s not moving fast enough.) His misguided policies will bankrupt the country. He’s arrogant, an apologist, a socialist. But what they aren’t saying is that he’s unprepared, in over his head, or not up to the job. Already, he’s faced at least two crises, one foreign and one domestic, in addition to the ongoing economic disaster and the daily demands of the job: the hijacking of an American ship by Somali pirates and the outbreak of the swine flu, a potential global pandemic. In the first, the president calmly ordered American snipers to take out the ragtag pirates if the ship captain’s life appeared to be in danger. It was—and they did. And praise for the president’s steady hand was virtually universal. The second crisis is still unfolding, but again, the president’s response has been swift and steady, as he and his team have worked to calm and inform a worried public. People have responded by showing confidence in the president’s leadership. His job approval numbers are in the mid-to-high 60s, his personal approval numbers are higher yet, and a sizable majority see him as a strong leader and able commander in chief. John who? As for Michelle Obama, her reversal of fortune has been so swift and so complete that the only criticism she’s faced, if you can call it that, has been answered in the same breath it was uttered. She touched the Queen! But the Queen touched her first! Or She wears too many sleeveless dresses! But her arms look great! Meanwhile, she hosted a reception for women’s-rights icon Lily Ledbetter after her husband signed the Fair Pay Act; began her outreach to military families; oversaw the planting of an organic garden on the White House grounds; became a fashion icon; engineered the adoption of a new dog; and helped her two unspeakably cute daughters adjust to their new circumstances (where they set their alarm clocks, get themselves ready for school, and make their beds every day). 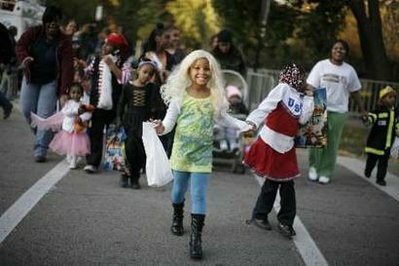 Gone is the stereotypical angry black woman. Front and center is an accomplished American mom, the center of gravity in her admirable American family. How did our impressions of these two change so quickly? 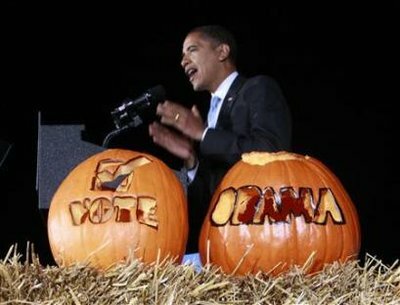 Mostly, it seems, because of the exceptional personal qualities of both Obamas. Ideology aside, they are honest, hard-working, disciplined—the kind of “family values” folks that have always loomed large in America’s image of itself. Perhaps those qualities were harder to see when we knew the Obamas less well. Perhaps they were a bit obscured by well-worn stereotypes of ambitious politicians, career women, and African Americans. And maybe, when all is said and done, those early vulnerabilities will in fact loom larger than they do right now. But at least for the moment, Barack and Michelle Obama have filled out their own portraits, making them more complete, more complex, and more appealing than they were a hundred days ago. Even if the milestone is as fabricated as the Easter eggs on the White House lawn, that’s an impressive accomplishment. So what’s really up with some of our Governors? I’m making a list and checking it twice and have realized that in the past five years we’ve had an overabundance of distractions in Governor Mansions throughout the U.S.
Of course we have some really great Governors as well. First and foremost we have Gangster Governor Rod Blagojevich – Chicago’s own Al Capone would be proud. I don’t know what to say that hasn’t been said about Blagojevich this past week. Gangster Blagojevich’s antics are way too rich and splendiferous to be called typical. My personal belief is that he is egotistical to the point of stupid. 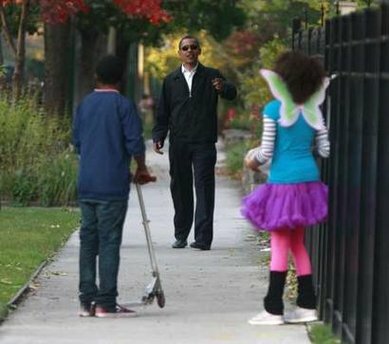 All eyes have been on President-elect Obama and Chicago these past several weeks so Blagoidiot made a decision to sell Obama’s vacant seat while he himself is being investigated by the FBI? Insanity. Ludicrous. Stupid. Today for the first time we hear from former Illinois Governor George Ryan, 74, who is seeking early release from a 6 ½ year prison sentence from President Bush. Ryan wrote a three page apologia where he tells the people of Illinois that “I want to make things right in my heart, with God, with my family and with those that I have hurt.” Ryan, a Republican, was convicted of corruption in 2006 for a racketeering fraud scheme and is serving a 6½-year sentence. 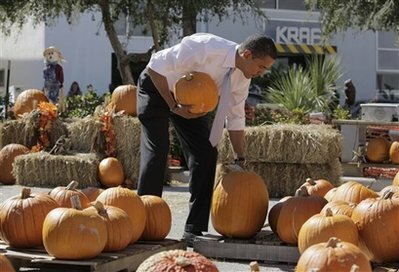 Obama Halloween Pictures – Happy Halloween!!! 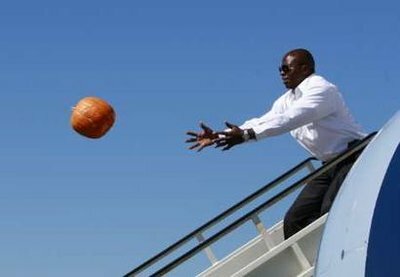 Does Reggie catch the pumpkin? I guess Reggie caught the pumpkin! 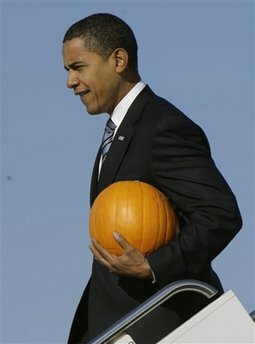 Obama takes home the pumpkin! 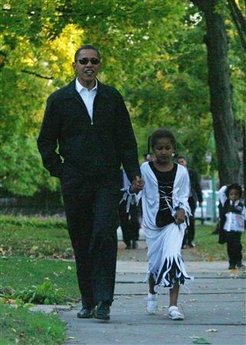 Obama and Sasha go trick-or-treating! 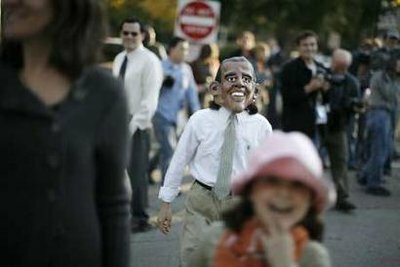 Someone even came as Obama!